I recently lost cobra coverage after 20 years of working with the same company, so shopping for insurance seemed like an overwhelming task. I also have several serious medical conditions that require specialists, so finding the right coverage was very important. Dennis Vallejo helped me to find a health plan that included all of my doctors and has sufficient coverage. He did not try to push the most expensive plan, but instead gave me all of my options and then allowed me to choose which one suited me best. The process was quick, and he managed to answer any and all questions that I had...and there were a lot!! He’s very patient and responds quickly. The staff in the office is also very friendly and eager to help. Advisors to anyone. In fact, I recommended my parents, and they had the same great results. This is a great place for all your insurance needs! Divine intervention is all I can say about this whole experience. I had no idea this kind of service existed, but NOT only that Dennis was exceptional in his knowledge and tenacity in helping me and family get insured affordably. I am so grateful for Dennis Vallejo. A friend referred me to Dennis and I was very impressed with his knowledge of The Market Place and its plans. I am newly self employed and Dennis put my worries to rest. He walked me through the plan I chose (which is the one based on our previous conversation he had already researched and recommended for me). Dennis goes above and beyond his job! He took the time to look up my preferred doctors which I will be able to continue seeing. 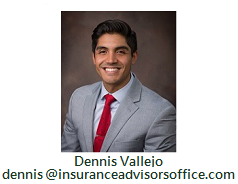 I highly recommend Dennis Vallejo for all of your insurance needs! Super Good Guy! I would like to give my most sincere gratitude to Dennis Vallejo for the time he invested in selecting the best health insurance plan for my family. We have a family of 8, so not only did we need an affordable price, but also an excellent plan. Thanks to his thorough knowledge, I was able to select the appropriate plan for my family's needs. Once again thank you and I recommend anyone interested in a health insurance plan to schedule an appointment with my Insurance Advisor, Dennis Vallejo. Quiero agradecer especialmente a Dennis Vallejo por el tiempo que me dedico a elegir el mejor plan de salud para nuestra familia. Yo buscaba un buen plan de seguro ademas de un buen precio, pues en nuestro grupo familiar somos ocho. Gracias a su conocimiento acerca del mercado de salud elegi lo que mas se ajustaba a nuestras necesidades....Nuevamente gracias y recomiendo a todas las personas interesadas en un plan de seguro de salud que visiten a Dennis en las oficinas ubicadas en River Ranch..
My experience with Dennis Vallejo and Nolan Venable with Insurance Advisors was truly amazing. They were so professional from the beginning of my meeting to the end. They were so knowledgeable about health insurance and my insurance needs that it just blew me away. I was so impressed that I will also start having Tax Advisors prepare my taxes for me. Whatever your needs are whether it's Insurance, Investments, or Tax Services, I highly recommend these companies. You won't regret it I assure you!!!!!!!!! Dennis Vallejo was great! He went above and beyond to assist with my insurance needs. I was impressed with his knowledge of the Marketplace Network. He assured me that if I ever have any questions his door was always open. I will definitely refer my family and friends to him. Thanks again for a great experience! As first time health insurance buyers, my husband and I were really dreading the process because we've heard how complicated and terrible it can be, but Dennis Vallejo has been a lifesaver. He helped us get short term health insurance until we were eligible for enrollment through healthcare.gov! Once we were eligible, he found a plan that is both affordable and provides coverage that fits our lifestyle. Meeting with Dennis is always a pleasure. He puts technical terms into language that we can understand. Throughout the whole process Dennis took care of everything, we didn't have to lift a finger. The entire team is very helpful and welcoming. Anytime we need anything, they are happy to help. We highly recommend Dennis and the rest of the knowledgeable staff at Insurance Advisors! I first met with Nolan at Wealth Advisors and I was so pleased with his advice and recommendations that I decided to call Insurance Advisors. Jonathon spent a lot of time asking questions to help determine what insurance coverage I would need. He also spent a lot of time explaining and educating me on what the items meant rather than just increasing my coverage. In the end he helped me reduce my insurance bill but advised me that the insurance company I already was using had the best rate! What other insurance sales person does that? I want them to have my business. I feel I can trust them to have my best interest, and that's not something you can say about many companies. This is a great company with amazing educated service oriented staff. It has been an absolute pleasure working with Nolan Venable through the years. Most recently, my husband and I worked with Dennis to decide on the insurance policy that works best for us. He was very knowledgeable and honest with us when he reviewed our options, and we are very happy with the decisions we made. My experience with Jonathan at Insurance Advisors was so awesome! I have never worked with anyone that was so helpful and so honest. He spent quality time explaining everything about insurance planning in a way that I can understand and learn. Everyone should give Jonathan a call. It is definitely worth your time. A big thank you to Dennis and all of the staff for being so inviting and professional. So helpful and eased the stress of understanding insurance! Will always send friends and family! I would like to say thank you to the staff at Insurance Advisors on the their professionalism and excellent customer service care. Thank you Jonathan for helping me with my new insurance coverage for 2017. You were a tremendous help. Leslie was also awesome in 2016. Insurance Advisors helped us not only with our insurance needs, but also with our tax returns. I would recommend them to anyone. They make you feel very comfortable the minute you walk in the door. Sorry it has taken me so long to write this review. Thank you again for everything. See you again soon. Working with Insurance Advisors was such a blessing. The first person you meet when you walk in is Amy, she is incredibly sweet and pleasant. She immediately took me in to meet Dennis, he was such a blessing. Insurance can be difficult/ confusing, but he is very patient and knowledgeable. He made sure I had the best plan that works for me and I left feeling so relieved knowing I had the best coverage. As soon as I left I immediately referred 2 other people to meet with Dennis. I am extremely happy with the service provided. I cannot tell you how pleasant & helpful the Staff were. Especially, Dennis. My situation was a little complicated, but not only did he take my insurance problem on, he did it so quickly & efficiently he did with putting "Me" first. There aren't enough words to thank him for "lifting the weight" off of me. Thankful & grateful!!! Customer service and professionalism at its best! Nolan and his staff at Wealth, Tax, and Insurance Advisors provide extraordinary customer service while working together as a team with their customers' best interest at heart. Nolan's expertise on tax and financial planning is top notch. His passion, enthusiasm, and true desire to educate and assist his clients in multiple aspects is truly impressive. The entire office staff is friendly, knowledgeable, and always eager to help. I feel blessed and privileged to work with Nolan and his outstanding staff. I just can't say enough good things about the Insurance Advisors, LLC Team especially Dennis Vallejo whom I recently started working with in selecting my medical insurance needs as well as for my family. Insurance can be a complicated choice & major purchase, but Dennis takes the guesswork & frustration out of the task. He's very knowledgeable, personable and he's a 24/7 kinda guy...a real joy to work with. If I have questions, I do not hesitate to ask him & never feel I'm every bothering him with a phone call. When I leave his office I feel confident and at ease knowing he has my best interests at heart & he takes as much time as needed to accomplish my goals. He treats his clients like family -- thank you, Dennis! I would like to commend the staff at Insurance Advisors on their excellent customer service. The whole experience was all around positive from the moment you are greeted at the door. Dennis made sure to take his time to find the best plan for me. I really appreciated that! I highly recommend Insurance Advisors to anyone out there! Jon made the insurance policies easy to understand. He guided us through different policies and explained each one and benefits of each. The savings were great and the coverage was better than we had last year. He was professional and it was a pleasant experience working with someone who took the time so we had a better understanding of what we were getting. I highly recommend using his service! THANK YOU! Big thank you to Dennis Vallejo for taking the time to go over the possibilities for my health insurance needs. I still can't believe the money I will save with my new policy. I kept asking him are you sure this correct? He assured me and can do the same for you. Give them a chance, you will be surprised at the options out there. I will recommend Dennis to my friends and anyone in an insurance dilemma. Keep up the good work! I’d like to say thank you to Dennis Valleio for the amazing job he did in helping resolve my insurance needs. He was very knowledgeable, professional, and passionate about making sure I was taken care of and even saved me a lot of money. Over the years I’ve talked with several agents, but never have I dealt with someone as “IMPECCABLE" as Dennis. It’s rare to meet someone with as much passion as he displayed. I highly recommend Dennis to anyone who is looking to save on their insurance needs. If that applies to you, please call and speak to Dennis and his team. If there had been a 10 star rating, I would have given him that! I am very pleased with the outcome of my appointment with Jonathan Eleser, an Advisor with Insurance Advisors. He helped me find the right health insurance plan for me. Being an entrepreneur, it's difficult to make so many crucial decisions alone. Thanks for taking the time to explain options and guide me to make the right decision. Great work, Jon! Just left the office of our Insurance Advisor Jonathan Eleser, he's an Advisor with Insurance Advisors, LLC. We went there to discuss our next option for insurance enrollment. His help and knowledge was amazing and he helped us make sure we were taking the best option. With that being said he also informed us of the other services they provide in which we now have vision insurance and also looking at dental plans. I highly recommend this firm for anyone needing this assistance! An outstanding experience, Jonathon and Dennis are an exceptional team. I was truly humbled at the amount of sincerity, and professionalism discussing my questions and concerns. They also expressed in-depth knowledge and seemed highly motivated to listen and learn about my individual needs. GREAT JOB! The staff is very friendly and helpful and the service was exceptional. Jonathan and Dennis both were very helpful in finding the right insurance to fit my needs. They took the time to explain and answer all of my questions. They treat you like family and I would recommend them to anybody. I would also like to take this time to thank Nolan Venable and his staff, Amy and Erica for all their help. He and his staff really takes my business very seriously and I can't imagine what I would do without their help. I was very pleased with my experience and I highly recommend Nolan, Jon and Dennis for all your insurance and financial needs. Thank you! Truly can't thank Jonathan and Nolan enough!!! Had no idea what to expect when we went there, was recently laid off and we lost our insurance. They navigated through the system and found insurance plans that were more than reasonable and better than I could have ever have hoped for to say the least. To say that we are very satisfied is an understatement , I'm extremely grateful for the stress you have lifted from our family and I wish you guys success in everything you do, you deserve it. I will recommend you to others, you guys are very professional and personable. Thanks again Jonathan and Nolan!!! What a breath of fresh air meeting with Jonathon and other staff members at Insurance Advisors. After several days and attempts to complete an online application to obtain health insurance for my husband, ending in much frustration after several redirects and miscommunications, we were given Insurance Advisor's number from someone who had experienced the same. We contacted the professional and very accommodating I A. Our appointment with Jon was more than expected. He understood what was needed and after reviewing our options, helped us not only apply for health insurance but dental and vision. In minutes we applied, were accepted and covered. This was truly a stress free experience. To know there are still people who actually care and take pride in their work so as to handle needs of people such as us, is indeed refreshing. We were vey content with not only Jon, but the complete staff at Insurance Advisors. I would like to take this opportunity to thank Nolan Venable and his staff for providing me with affordable health care insurance . As a single woman in her 60's I was overwhelmed with decisions concerning health care, taxes and financial planning for my future. Mr. Venable and his entire staff eased all my worries in a professional , yet personable, way. I now have affordable healthcare and a firm to help me with my taxes and plan my financial future. I would highly recommend their services to anyone. Ms. Leslie, many thanks for your assistance in securing the best insurance plans for my wife and my youngest son in the past two weeks. It is a joy to work with people who know their business. It is important in noting that this office offers complete service beyond insurance planning. Being able to conduct tax planning, investments planning (IRA' and 401K) and insurance planning in one office that works cohesively in advising the best strategies for their clients. Thanks again to Nolan, Jennifer, Todd and Leslie. I would like to thank Nolan's team on finding a health insurance policy that has saved me money with a much better policy. His team are very professional and takes great care of our needs. I would highly recommend them on preparing anyone's insurance needs and also taxes. Once again thanks for your professional help. I would like to thank your office for finding us affordable health insurance. Mr. Venable and Leslie were very informative. Leslie called me personally to find out how My knee surgery went. I thought that it was very thoughtful and considerate. I am truly pleased with their services. I would definitely recommend them to others. As always, I am exceptionally pleased with all the many services & products my family & I have received & continue to receive from Nolan Venable & his very helpful, personable & knowledgeable staff. Great people that treat their clients like family. I would highly recommend them to all my family & friends. Extremely impressed with out experience here. We were greeted by Amy, who was exceptionally pleasant. We arrived 30 minutes early for our appointment, and were taken into the office immediately. Leslie and Nolan went above and beyond to get our family the best insurance coverage for the best price! Our experience here was stress free and personable. We truly felt at ease making important choices for our family. Another perk was the complimentary cup of coffee and awesome decor. We definitely recommend Insurance Advisors for financial advising, insurance, and tax preparation and planning! We were very pleased with Nolan and his staff. Everyone is friendly and very knowledgeable about their products. Thanks guys!! This team is AMAZING! Nolan was very helpful in explaining the policies; and figuring out what worked best for me in my health and finances. The reminders, follow up, policy, and advise were above my expectations. I am so happy with my policy, and EXTREMELY happy I found such wonderful advisors. They take care of business, but treat you as a friend. The entire staff is excellent! I will continue to recommend them to others. Insurance Advisors received a rating of 5.0 out of 5 based on 35 reviews on IWantInsurance.com.